If you're set on greatly increasing your odds at Discovering how to exploit the profit potential of real estate.... Then this may be the most important letter you'll ever read! To Selling Real Estate Quickly And Easily? guide will help you flat out sell more Real Estate! Are you planning on Becoming a better Real Estate seller or simply want to? If so, pay attention! I myself have been selling Real Estate 15 years now, but it wasn't easy for me when I first started! I mean, information on this is pretty hard to come across. Especially the kind of information I wanted to know more about. To be quite honest with you, I got tired of looking and searching all over the place, so I decided to create the Insider's Guide To Selling Real Estate! Book On Becoming A Real Estate Seller You Can Find In Any Store.. This book covers everything there is to know about becoming a Real Estate Seller. In fact, some people have called it the "Real Estate Guide"! It's like having your very own Real Estate expert that you can reference and ask questions anytime that you need to! 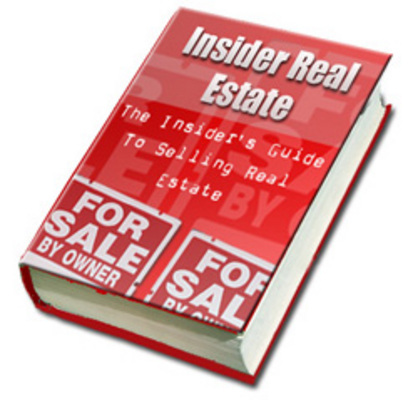 Uncover With The Insider's Guide To Selling Real Estate. * Discover What Buyer's are really looking for! * Learn what can mean everything in selling real estate. * The steps you need to take to becoming a professional real estate agent. * Discover how to find Hot properties! * Learn the basics of leasing instead of selling. * How to price your property right for your market. * The most common selling mistakes. * How to seperate the good from the bad properties with ease. * Find out what your buyers are looking for! * Discover what a buyers pool is. * Tips for real estate loan applications. * Find out the Hot Secrets that a select few real estate agents won't tell you! * Discover how to exploit the profit potential of real estate. * Learn all the different types of mortgages easily & effortlessly! * Selling homes through FHA loans Tips. Here's to you, and your new extremely successful Real Estate Selling Venture!